This colorful space wallpaper is a radar composite image shows changes in large-scale agricultural plots in southwest Iran. The image was released March 28, 2014. 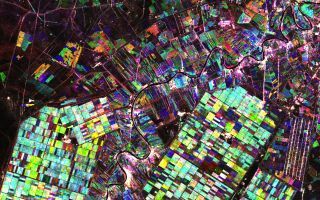 This colorful space wallpaper is a radar composite image shows changes in large-scale agricultural plots in southwest Iran. The individual images were acquired by the radar on Japan’s ALOS satellite on Nov. 16, May 16 and Oct. 1, 2010. Combined, the different colors show changes in the fields – such as harvesting at different points on time. The most prominent fields in this image each measure about 1 km across. To the lower right, the smaller structures are ponds for aquaculture. Important fish for inland fisheries include carp, roach and mullet. The image was released March 28, 2014.